Welcome to the Holiday Inn Express Hotel & Suites Lake Placid- FL Relax at the newly built Holiday Inn Express Hotel & Suites Lake Placid- where we offer premium amenities and VIP treatment in a warm- welcoming atmosphere. Families will enjoy staying at our Lake Placid hotel - located just off Highway 27- because of our convenient access to local attractions- including Gatorama- Sebring International Raceway and fishing and water recreation on 27 freshwater lakes. Other nearby attractions include the Lake Placid Historical Society Museum- Henscratch Winery and the Highlands Art League- along with numerous Florida golf courses and quaint antique shops. Business travelers appreciate our Lake Placid hotel because of our state-of-the-art accommodations. This hotel in Lake Placid offers close proximity to many local businesses including Lykes Brothers- Archbold Biological Station and the Florida Hospital-Lake Placid. Additionally- we provide an on-site meeting space that can accommodate up to 100 people. 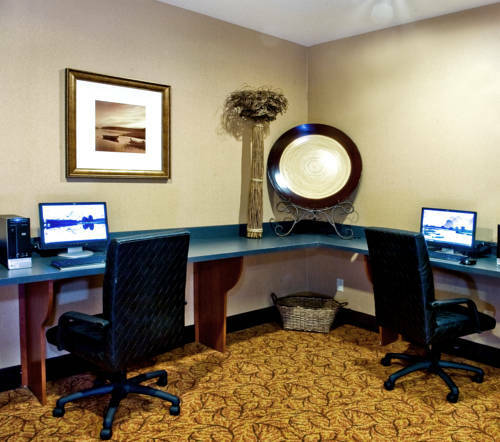 You can utilize our Business Center that offers a public computer- copying- printing- and faxing services- as well as free high-speed- wireless Internet access throughout the entire hotel. While staying at our hotel in central Florida you'll enjoy premium hotel amenities including a heated- outdoor swimming pool and tanning area a relaxing hot tub and a convenient Fitness Center. So Stay Smart at our Lake Placid hotel.